Fashion diva, Paris Hilton, and her well-dressed pocket pooch, Tinkerbell, are known for their haute couture – for being at the forefront of fad and setting tomorrow’s trends for celebrity worshippers worldwide. However, the Hilton heiress seems to be completely in the dark about the hottest fashion statement for pampered pets; the “Dog-Dot-Calm Lavender Bandanna” which comes directly from the organic lavender fields of Sequim, Washington. 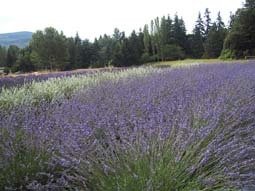 Located on the Olympic Peninsula in Washington State, Sequim is known as the Lavender Capital of North America. And for good reason. For the last eight summers during peak bloom season, this small town celebrates everything lavender by opening their fields of purple infusion and extending their homespun hospitality to an assortment of local, national, and international visitors. With seven lavender farms in the Sequim-Dungeness Valley, the farmers and the town are poised to share their knowledge of lavender cultivation to annual crowds numbering upwards to 30,000 people. Celebrations for the 2005 Lavender Festival are expected to be better than ever. For three days in July, the Lavender Festival features a variety of lavender-centric activities, including lavender lore, demonstrations, and agricultural history. Workshops on the many uses of lavender, aromatherapy, medicinal applications, landscape design, culinary applications, and handmade crafts are a few of the offerings. A favorite pastime for guests is the opportunity to indulge one’s senses in fields of fragrant lavender, while picking organic bouquets for take-home souvenirs. Another highlight is the street fair, offering an assortment of local foods and wines, live music, and over 125 craftspeople and vendors. Perhaps the real beauty of lavender lies in its adaptability and inherent calming properties that help soothe the soul. Not just people, but for pets, too! And that’s where the Sequim Lavender Company has proved itself most innovative. 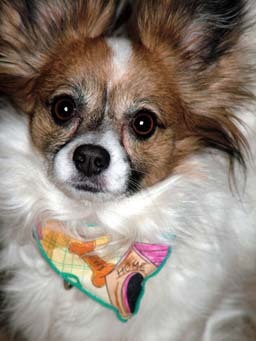 Featuring a pet bandana laced with lavender, it comes in a variety of fashionable patterns, from extra-small to extra-large. Everything is natural as nature intended, with no alcohol or pesticides used; it is dye-free and chemical free. “This is aromatherapy for pets,” according to Mary Lou Jendrucko, co-owner, designer, and crafter of the pet scarf craze “à la lavender.” She explains how lavender is both calming and a natural flea repellant. “And it’s amazing to see how dogs calm down and seem to have a smile when they wear it.” She quickly adds how many satisfied dog owners seek her out to tell her that the lavender bandanas really work. The doggie bandanas work so well that Jendrucko says they will be tried on Alaskan sled dogs for the first time this year. This will help these high-energy dogs calm down when they need to chill out. “Cats love them, too,” says Jendrucko, adding that the smaller sizes work well for them. An avid animal lover who owns rescue animals exclusively, she is so concerned about safety for pets that a Velcro strip is sewn into the scarf. This way, if the scarf should get entangled in something such as a fence, the pet can break free. 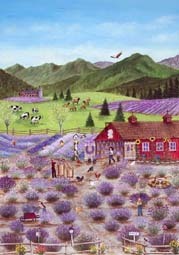 At last year’s Lavender Festival, the Sequim Lavender Company quickly sold out of their X-Large inventory. They also noticed that the motorcycle-themed flame material (American Chopper) went really fast in the X-Small. 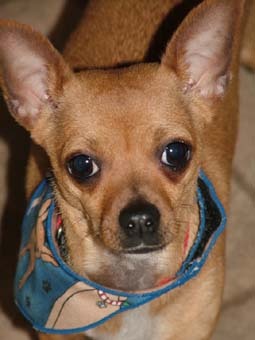 And according to Jundrucko, her two-pattern dog bandana makes for a really great fashion statement. Asked about some other popular patterns, she replies, “At the lavender festival, it is always my custom to have lavender print material.” Jundrucko adds, “I make some very comical, some country… I seem to make something for everyone.” She adds that at Christmas they had people down from Alaska, so the “caribou” patterns were very popular with them. So, how about it, Paris? 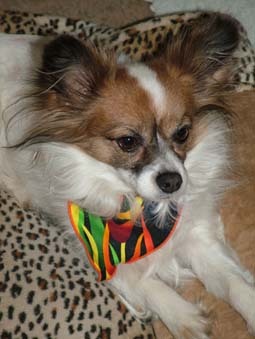 An X-Small “Dog-Dot-Calm Bandana” with fashionable flames or pink flamingoes for Tinkerbell? Besides being trendy, it might help calm her down after a busy schedule of partying and a hectic pace of tailing you 24/7. Karin Leperi is an award-winning writer/photographer with 2005 bylines in magazines that include Baja Traveler, Beyond the Badge, Mexico Traveler, Mississippi, Marco Polo, Maryland Life, and LowCarb Living. Her specialities include agritourism, (she is a Consultant for the International Ecotourism Society/TIES) travel, food, fitness and the environment. A member of the American Society of Media Photographers (ASMP) and North American Travel Journalists Association (NATJA), she can be reached at travelwriter@myway.com and travelphotographer@myway.com..